Ptl. 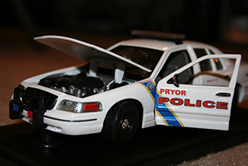 Michael Moore has been employed with the Pryor Police Department as a full-time Patrolman since March of 2005. Prior to his employment with us, Ptl. Moore was also a reserve officer for Pryor Police, as well as Chouteau Police before that. Ptl. Moore is being recognized on this page for his efforts to end a series of repeated burglaries for The Rural Electric Cooperative. After this business had been made a victim of copper theft several times, Ptl. Moore dedicated several hours each night he worked, watching for any signs of disturbance at the "R.E.C." building in Pryor. Eventually, thanks to Moore's efforts, two suspects were apprehended and charged.